Ivory tissue paper pom poms make great decorations for weddings, birthday parties, engagement parties or any special occasion. 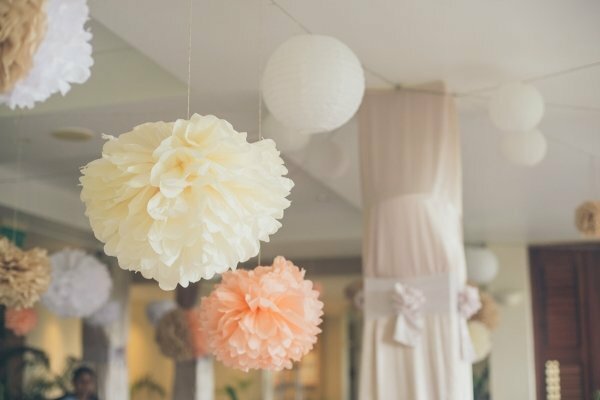 Tissue pom poms look great hanging from the ceiling, in trees or used to decorate your candy buffet table - these will add lots of colour to your event. Pack of 4 ivory tissue paper pom poms. Choose from 40 different colours of tissue pom poms. View full range here. Paper flowers are approximately 35cm in diameter when fully bloomed. Hang with ribbon or fishing line. Coordinate our large tissue pom poms with our mini tissue pom poms!